What’s so special about a luxury suite? Did you know that last year the price of a luxury suite for the Super Bowl cost more than double the average price of a house in the United States? What would compel a company to spend $450,000 on a few hours of entertainment for their best clients and prospects? What makes luxury suites at sporting events and concerts so special and how do companies use them as a proven tool to generate new business? The pre-suite experience. Even before you arrive at your suite, the experience is different. Suite guests often park in a designated parking spot, just steps from the private entrance designated for suite ticket holders. AT&T Stadium has taken this to the extreme: guests of some of the most prestigious suites actually get to park underneath the stadium and ride an elevator up to their suite. Now that’s one way to really impress your best client! Multiple HDTV’s so that you can get the benefits of watching in your living room while still being in the midst of the action at the stadium. A suite attendant is on-hand to ensure that your domestic beer is always on ice. Fancy in-suite catering – Dodger Dogs are great, but if you’re in a suite, why not splurge a bit? Try the sushi platter at Staples Center or the famously overpriced cheese pizza at AT&T Stadium. Private restrooms, the best of which have TV’s built into the mirrors, because if you’re in a suite, you shouldn’t have to miss a single play. Protection from the elements: while the rest of the fans battle the wind, rain, and snow, suites are climate controlled so that guests can stay focused on the important things, like finding extra whip cream for their hot chocolate in-between plays. Access to VIP stadium clubs, just in case you get claustrophobic in the suite and decide it’s time to hobnob with fellow high-rollers. Check out the Commissioner’s Club at MetLife Stadium for your next power networking session. Exclusivity and prestige. Guests are more willing to accept your invitation if you’re going to be in a suite than if you’re inviting them to another fancy steak dinner. A slice of privacy in the middle of the action. The atmosphere is conducive to great networking, relationship building, and fun. If you run out of things to talk about, just watch the game. Or go back for thirds on the bottomless nacho platter. Safety. Did you know that Veteran’s Stadium, former home of the Philadelphia Eagles, used to have a jail right there in the stadium? When you’re in a suite, you can more easily avoid the sorts of people who are headed for the stadium jail. 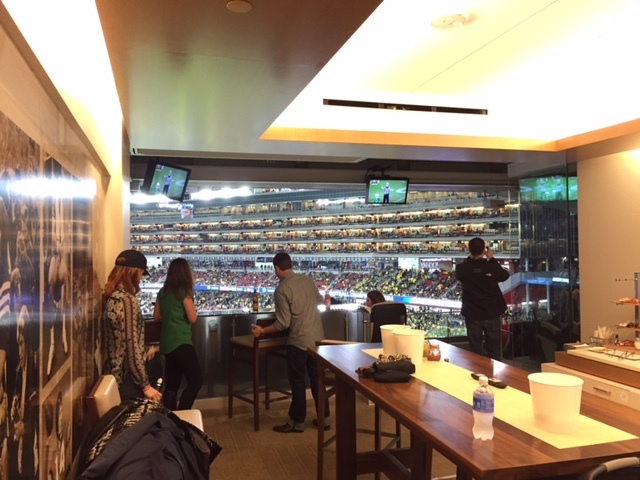 So the next time you’re putting together a group outing, consider booking a luxury suite for a sporting event. And before you get discouraged about the exorbitant price, it turns out that not all suites cost more than a house. In fact, if you know where to look, some suites can be had for less than $100 per ticket. Here’s to the suite life. As the President of Suite Experience Group, Mr. Spencer oversees all aspects of the business, including sales, marketing, and operations.